Virender Sehwag created history on Thursday by posting the highest individual score in One-day Internationals, and also registering only the second double century in the 50-over cricket format, in the fourth ODI against the West Indies, in Indore, on Thursday. The dashing opener proved unstoppable for the hapless Windies bowlers as he stroked his way to a magical innings of 219 from a mere 149 balls, slamming as many as 25 fours and seven sixes. 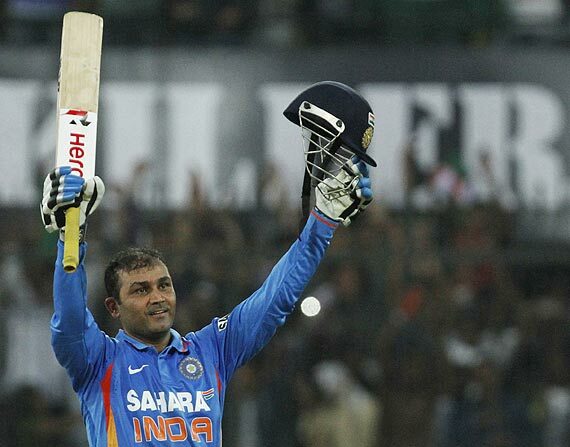 Riding on Sehwag's knock, India posted a mammoth 418 for five in their 50 overs, their highest ever total in ODIs. Sachin Tendulkar was the first batsman to get to a double hundred in ODIs, when he scored 200 not out against South Africa in Gwalior in February last year. Sehwag came into the match after a run of poor scores in his last few games. In fact, he scored just one half-century in his last 10 games. On Thursday, the slump ended in some style. He also has two triple centuries in Test cricket to his credit, and is the only player to score both, a triple hundred in Test cricket and a double hundred in ODIs. The 33-year-old Delhi opener started off aggressively, hitting the second ball he faced, from Ravi Rampaul, for a boundary through midwicket in the second over of the match. Thereafter, it rained boundaries and sixes at the Holkar Cricket stadium in Indore. Sehwag brought up his half-century, his first of the series, from 41 balls in his own unique fashion, a huge six over long-on. The hundred also didn't take long to come as he brought up the milestone for a mere 69 balls, the fastest century for India against the West Indies. Records kept tumbling, much to the joys of the fans in Indore. The 150-run mark came from 112 balls; he posted the fastest 150 for India. The right-hander did not slow down despite closing in on his double century; he took just 28 balls to race from 150 to 200. He got a lifeline when West Indies skipper Darren Sammy dropped a simple catch at cover when his score was 170. He later revealed that he did not change his style of play even when he neared the 200-run mark. "Never [changed my style of play]. I thought, if I just play the Batting Powerplay... and when Darren Sammy dropped that catch [on 170] I thought God is with me, and if I just bat till the 46th over I will get that double hundred," he said. Sehwag expressed delight at getting to the coveted landmark. "Everybody was expecting me to score a double hundred and I was happy to live up to everybody's expectations. It was a true batting wicket and whenever I was hitting the balls in the gaps, it was going for boundaries," he said. Sehwag's innings is now the highest ever against the West Indies, in all ODIs. He goes past Australia's Mark Waugh, who scored 173 at Melbourne in 2001. 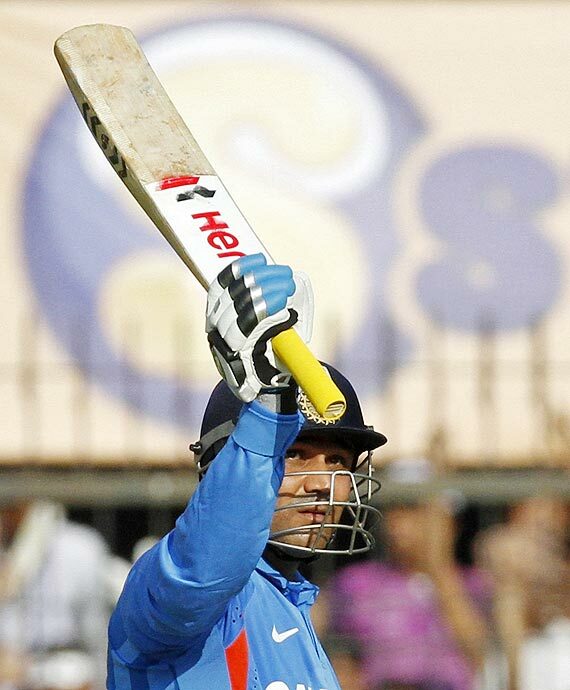 Sehwag's innings is now the highest in all India-West Indies ODIs. The previous best was Desmond Haynes's 152 at Georgetown in 1989. Sehwag's 150 was off 112 balls, the fastest 150 for India. Sachin Tendulkar had taken 118 balls for his 200 not out against South Africa in Gwalior in February last year. Sehwag's 69-ball hundred is the fastest for India in ODIs against the West Indies. He himself held the previous record with a 75-ball century, which he scored in Rajkot in 2002. 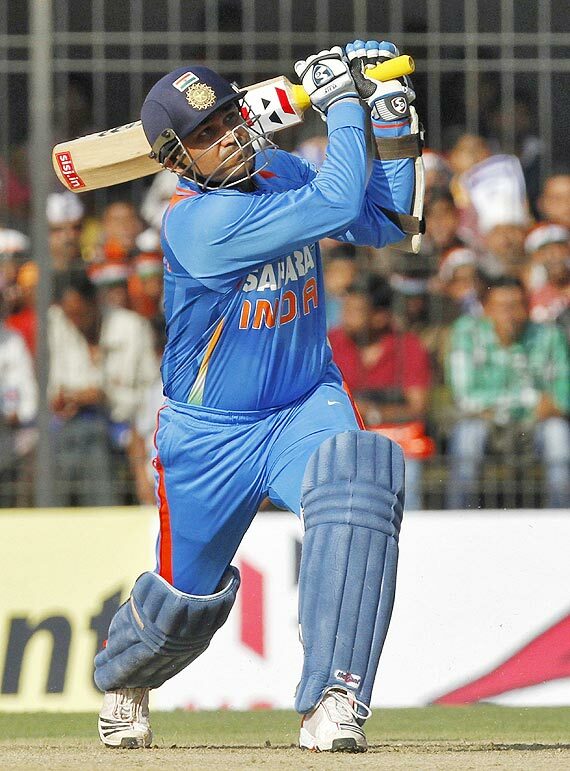 Sehwag's previous highest ODI score of 175 came against Bangladesh in the Feb 19 World Cup match in Dhaka.